US Secretary of State Condoleezza Rice and UK Foreign Secretary Jack Straw have urged Iraq's leaders to speed up negotiations on a new government. The pair made a surprise trip to Baghdad from the UK, after Ms Rice's two-day stay there hosted by Mr Straw. The talks with Iraqi PM Ibrahim Jaafari and President Jalal Talabani come as Iraqi politicians are struggling to form a government of national unity. The two are expected to give an update on the progress of the talks shortly. Ms Rice said the US regarded the formation of the government as a "matter of urgency". Mr Straw added: "We need to see progress and that is in everybody's interest." There is mounting pressure on Mr Jaafari, of the majority Shia alliance, to stand down as prime minister. He has failed to win the support of minority Kurds and Sunnis and now faces opposition within his alliance. Last week senior Shia politicians said US ambassador to Iraq, Zalmay Khalilzad, had told them President George W Bush "doesn't want, doesn't support, doesn't accept" the retention of Mr Jaafari. Mr Jaafari responded by saying the comments undermined Mr Bush's commitment to democracy in Iraq. Speaking to reporters travelling with her to Iraq, Ms Rice said: "The fact that we're going out to have these discussions with the Iraqi leadership is a sign of the urgency which we attach to a need for a government of national unity." She added it was "important to have fresh messages from time to time from Washington and from London". Mr Straw said the US and UK would recognise and respect whoever emerged as leader. The White House has denied the US is backing away from Mr Jaafari. But the BBC's Mike Wooldridge in Baghdad said it might explain the apparent stiffness when Ms Rice posed for photographs before talking to the prime minister on Sunday. After the president met Ms Rice and Mr Straw, Mr Talabani's office released a statement saying they had discussed "the efforts exerted by the representatives of the political blocs", the Associated Press news agency reported. Mr Talabani also briefed them on the negotiations, and the decision to form a political council and ministerial committee for national security, the statement said. 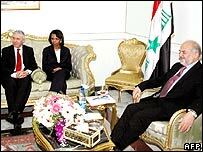 Ms Rice and Mr Straw also met Vice-President Adil Abdul Mahdi and other Iraqi leaders. Sunni Arab politician Adnan al-Dulaimi told AP the talks had been about "the Iraqi problem in general, about the government formation and the security problem. "We also talked about hurrying up in forming the government because the Iraqi people have grown bored of waiting. Our points of view matched." Mr Jaafari was chosen as PM by the ruling Shia-led bloc after it won December's election. But Kurdish and Sunni Arab parties have rejected the nomination and have threatened to boycott a government unless he withdraws. The delay in forming a government is thought to be partly responsible for fuelling the increasing sectarian violence which has struck Iraq since last month's bombing of a key Shia shrine at Samarra. Ms Rice arrived in Iraq after a testing trip to the UK. She admitted the US had made thousands of tactical errors in Iraq, but later said she was only speaking figuratively. She also had to face a number of anti-Iraq war protests in north-west England.